CPS took a mixed ability swimming team, with more novices than squad swimmers, to the Cranleigh Schools’ Gala last night. It was a very closely contested event, with CPS and four other local schools taking part. The aim was to encourage those children who do not swim regularly with a school team to simply “have a go” in a competitive arena. There was a great team spirit and our swimmers were delighted when they retained the Girls’ Trophy for the fifth consecutive year but also won the Overall Schools Team Shield, which we lost out to Park Mead last year. 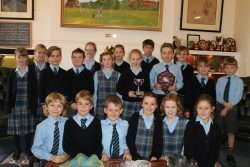 The competition between Park Mead, Cranleigh Primary and CPS could not have been closer, with several races finishing up to the wire. A special mention to the U11 boys’ team; many had only just finished playing in a rugby tournament in the morning, before then swimming in the afternoon! The U11 girls’ team retained dominance in the relay, with masterful swimming of two meter leads in many of the individual races. Lisa Waller, swimming coach, says ‘Thank you to all those children who swam up, not just one age group but two years their senior, to make up a team: Jacob M, Wren H-D, Abigail W – most finished 2nd on many occasions. ‘Thank you also to the parents that came to support this event as it makes all the difference to the children who take part’.